The Tampa Bay Buccaneers are an NFL team who has a lot of talent, but absolutely in the wrong division in the NFC South. The Bucs are about a year away from really competing & making noise for a division championship, but the team has nice pieces to build around for the future. The team had a very rough 2013 season, having the stadium basically condemned for a mersa outbreak in the facility, then head coach Greg Schiano was losing the players trust & respect, but during the season, quarterback Mike Glennon got the team turned around & the team went 4-12, when many people thought they would go 1-15 or even 0-16 at points. Tampa Bay Bucs QB Mike Glennon has to show early on that he can be a true starting quarterback in this league under the new system of Lovie Smith. Glennon showed a lot of promise, but just didn’t have the great help around him. Running back Doug Martin came back down to Earth after a breakout 2012 season where he found himself in the Pro Bowl & Vincent Jackson was the only big target that produced. Mike Williams was strong, but the team as a whole just lost their will & desire to play for Greg Schiano. Out went Schiano, in comes Lovie Smith, a coach who was amazing for the Chicago Bears for many seasons, leading them to SuperBowl XLI where they faced the Indianapolis Colts. Smith is a noted defensive coach, which is actually not where the Bucs are struggling, as they were middle of the road in defense last season. The big question about this team is whether Glennon or Josh McCown is going to lead the team. 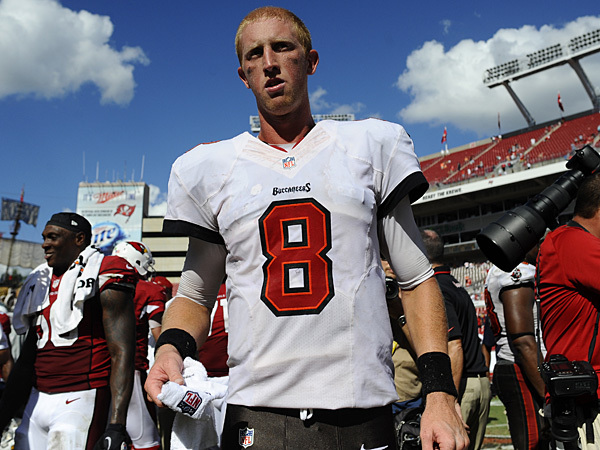 Glennon has earned the right to at least have a chance to start the season. Josh McCown has done a great job as a backup in the league, but we don’t know how he can do in terms of being a franchise player & until the team figures out who their leader is going to be, the Bucs will end up struggling this season, which may not be the worst thing, however. The smart money is that if the Bucs end up struggling this year, the team will look at the quarterback talent in the 2015 NFL Draft where its expected that Jameis Winston from Florida State, Bryce Petty from Baylor, Marcus Mariotta from Oregon & other top quarterback prospects will be available for drafting. If Glennon or McCown aren’t the future, then the team will have strong receivers available in Mike Evans & Vincent Jackson, two big targets who can go up for the ball. Evans, the rookie out of Texas A&M, maybe used to catching balls from unorthodox quarterbacks or quarterbacks who are scrambling for their lives because he had to catch balls from Johnny Manziel when he would running all over the place making plays. This year, I see the Bucs being 4-12 or 3-13, but they will be involved in every game this season. This is a team that could be a playoff spoiler for someone who might be sleeping on them.